The very first step pillion took on the 'foot rest, cover' she said NO, just NO. She knew at first step that Yamaha had made the covers squishy. Then a few days later the big brown truck dropped a package on our front steps and ever since we have had Gen I/2 foot rest covers. Agree. I just feel more planted on the non-squishy version. This is one of the things you've been waiting for....... finally decided to muscle a big piece of hardware. The new engine was on my hydraulic dirt bike lift, strapped on such that I could raise the lift and "walk" the beast over to a place right beside the main lift. Figured I could walk the engine off the lift onto a piece of plywood sitting atop my two scissor jacks, I'd slide it under the frame, knew I'd have to tilt it forward first..... get it slid in, tilt it back, jack it up. Genius, how hard could that be? And yes, I am doing this all by my lonesome. Guessing the engine weighs 200-250. I did kinda lift/walk it off my truck's tailgate onto the dirt bike lift a year ago, but no way I'll attempt to lift it now. So, a little creative and careful planning........ here we go, I can hear you now, OMG hold my beer watch this! Getting it onto the plywood/jacks was pretty simple. Because of the steel plate on steel jacks, easy enough to slide it into place. 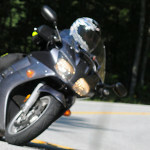 Frame comes down at the front, so have to tilt the engine forward and lined up such that it will slide in sideways. Not enough clearance, so remove a jack, slide it under the suspension pivot, jack the frame up higher. Hmmm, can't get enough. With a little help from some 2 by pieces, ended up taking the other jack out so the only thing the engine sits on is the plywood. Still had some creative tilting and such, but it's lined up now. Hint for you at home, if you're working alone, best not install the coolant pipe, as you'll need the room to tilt, etc. and the front tire gets in the way. Front wheel, BTW, is clamped into the lift so the lightweight frame won't move. In case you're wondering, I was only wishing I could do it with that remote control, but alas, no ceiling hoist. With creative use of various wood pieces and a pry bar, jockeyed the engine up high enough to get a jack under it. Lift, tilt forward (with appropriate ratchet strap as safety from falling too far forward), slide back, etc. going from side to side. There's not a lot of side to side clearance inside that frame and everthing has to be lined up just right to get it such that I could put the rear lower engine mount bolt in, watching the middle gear u-joint guard doesn't get hung up. Carefully jack it up, get one of the upper engine mount bolts in, go to the other side, line it up, put that one in. EZ PZ. Felt good. This whole operation took about an hour and a half, including a few "let's think about this for a minute", get a coffee, hmmm, where does that wire go, and then just methodically make it happen. At no time was anything bad going to happen, now gimme back my beer! I thought I did pretty good for an old guy. I spent a bit more time cleaning up the corrosion on the engine mount bolts, coating them with anti-seize and installing all bolts but the front lower ones where I will put the sliders back on. 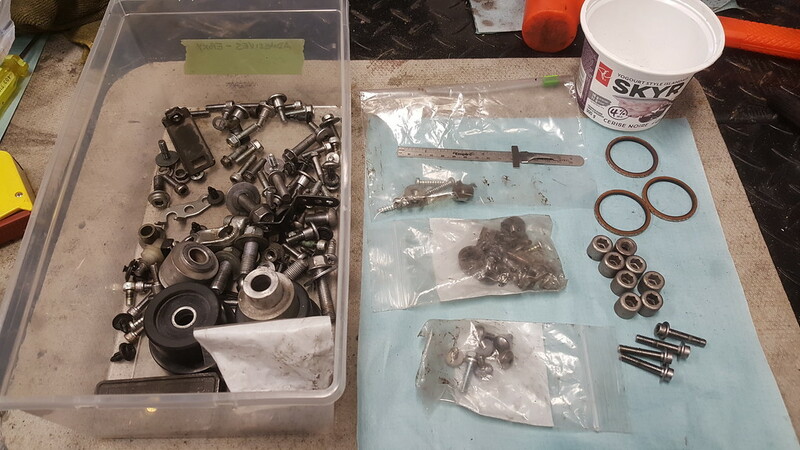 Best follow the order of loose install and tightening in the FSM, as mostly the left ones have to be done up first and the right ones have bushings with pinch bolts, self-seeking locations. 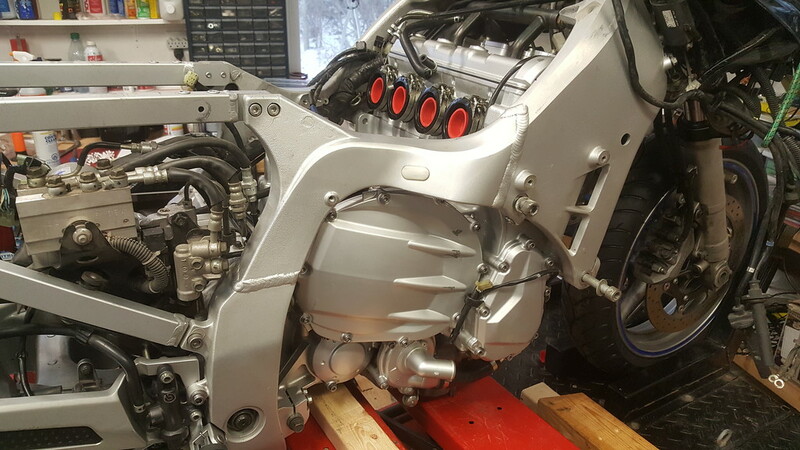 The engine becomes part of the frame when it's all done up. Note to Festus - Even with a helper, it is just way too finicky to attempt lining up the driveshaft and installing it as you go. You were correct, best leave that and final drive/rear wheel assembly until after the engine is in place. Lesson learned. However, I don't feel so bad as I have to remove the rear wheel again anyway to install that missing spacer. I read this over on the other forum, but had to read it again over here to see if this time you threw your back out or lost a finger. Well done! Ummmm, there is an open invitation, several didn't show, so I had to just git 'er done. Come on over any time. No small animals were harmed and no fingers were lost or even pinched, no delicate castings broke, but I am missing a coupla parts.... exhaust gasket for one is holding me up, will pick one up today locally I hope. Still lots to do in the meantime. 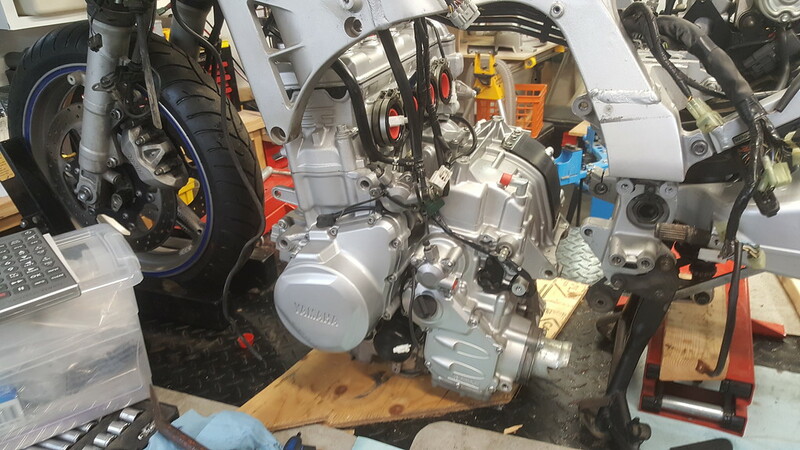 I thought the hot ticket for doing that job was to lower the frame over the engine as opposed to fuxoring with the engine in the stationary frame. Six of one, half dozen of the other... given the tight clearances, I think it's easier to lift the engine into the frame rather than having the frame swaying around on a skyhook. As it is, pieces of frame were contacting the beauty parts (stator cover, etc.). 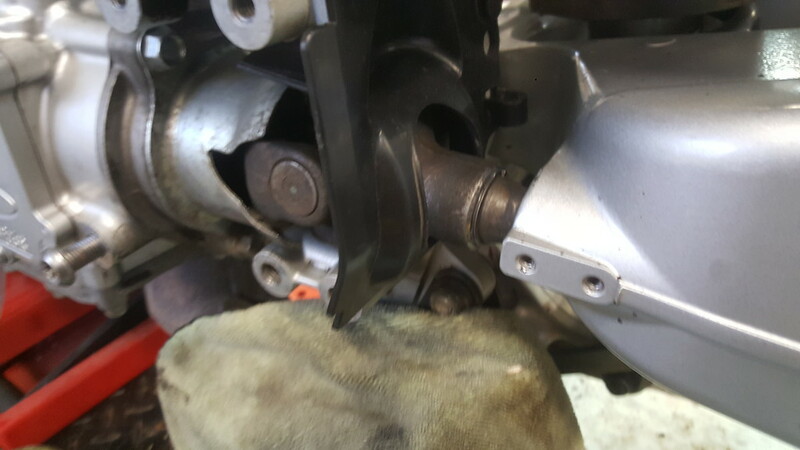 Driveshaft cover was getting hung up at the swingarm end... millimeters of clearance. Wasn't that bad, really, if I'd had a helper to work on both sides at once, it all woulda happened in under half an hour, but I was in no hurry. Keep calm and carry on as they say..... felt good to git 'er in there fer sure. 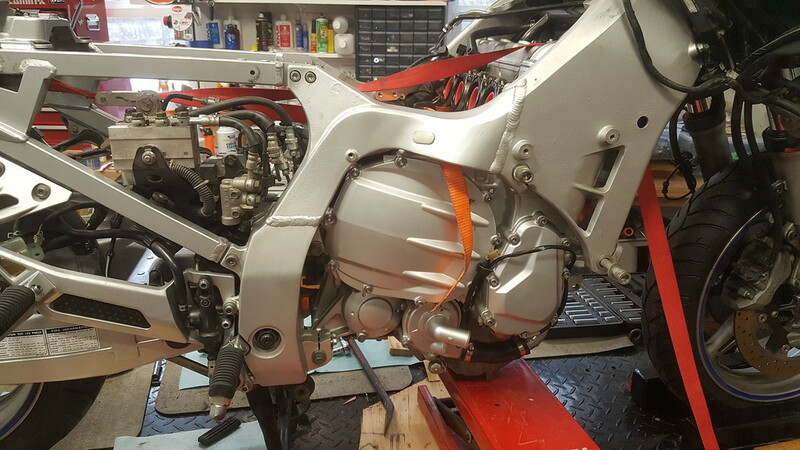 I suppose you had to lift the rear end of the chassis somewhat in order for the cylinder head to clear the frame as you slide the engine over? One thing I observed doing my valve check over the weekend (still not completely done - t/b sync today) is that I do not think you can make a mess up with the wiring harness connectors. Every time I've done the valve check, I've marked each side of each connector but it would appear that each connector is absolutely unique. I believe all 4 of the spark plug boot/coil connectors are the same, though. I suppose in that light you could conceivably connect cylinder #3 in the #4 hole? Otherwise, I can't see any similar connectors anywhere. PS - At one point I did raise the rear chassis, slid the engine in as it was tilted forward like a Vee, but 'twas no advantage after that, best left sitting on the wheels. Wheatie, you're acting like I lied to you or sumthin. Get over it, I can't help it if youse guys are easily distracted and can't remember post #2. You don't have to pay attention if you don't want to... but as Marty would say when you're following him, try to keep up will ya! Hardware and sorting out baskets is one thing, but let's talk electrical for a sec. Mainly the electrical that you have no clue about what the previous guy had done. I know he didn't do it himself, suspecting the Certified Yamaha mechanic had his fingers in it. When installilng the engine, wondered why there was this 10 ga. ground wire run down to attach where the factory ground attaches at the lower front of the engine. Followed it up, pulled it out, and here it is. At the top end is the 10 ga. with some smaller ground wires soldered to it, wonderful job (not up to DesignFlaw standards nor mine), not wrapped up very well, nor is it what I would do... gee, the battery ground post was like 3" away, why not go there instead. Followed the trail to a relay tucked up into the mirror mount area, oh boy, big spade connectors and more "power" wires going somewhere into some convoluted harness wrapped up over the steering head to the other side. Followed some spaghetti... hmm looks like it powers the Fiamm Blaster horns, but there's more. In the harness I pulled out, there's a cluster of spade connectors, enough for a relay but relay gone. 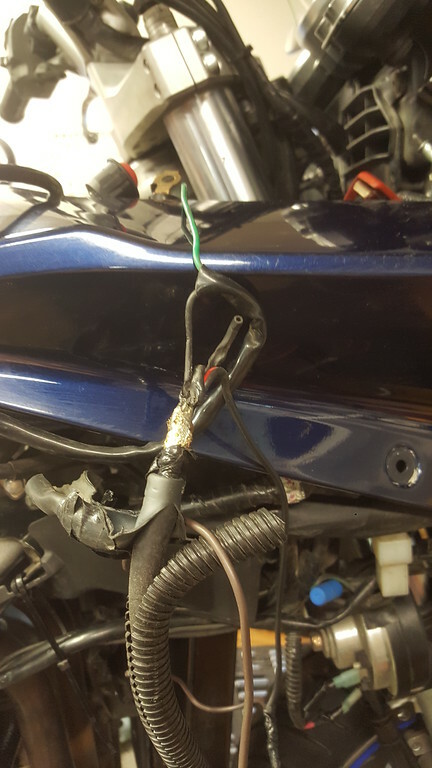 I know buddy had them remove some of his farkles to transfer to the new bike, so yeah, just snip, unplug and go, it's now my problem. I suspect that branch was for fork lights, which of course are gone. On the other side, a pair of spade connectors, presumably (for the moment) the light switch. Velcro on the handlebars, dunno what was attached there. Dunno how the horn switch is tied in, will have to verify. I can't do much up front right now because the wheel is chucked into the lift vise and I need to turn the handlebars side to side..... Later. I don't dare hook up a battery until this is taken care of. I have let the smoke out of stuff before, but mostly it was by accident. Besides, I don't see no fuses protecting this. 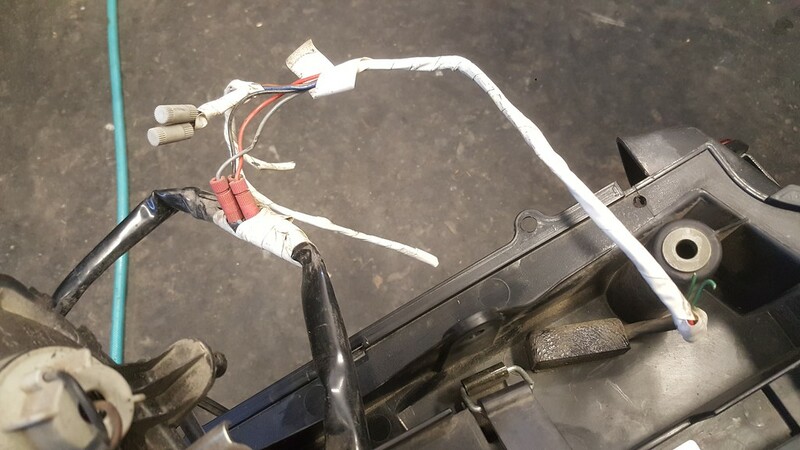 At the back end, found this tied into the rear tail light harness, ya gotta love white tape! 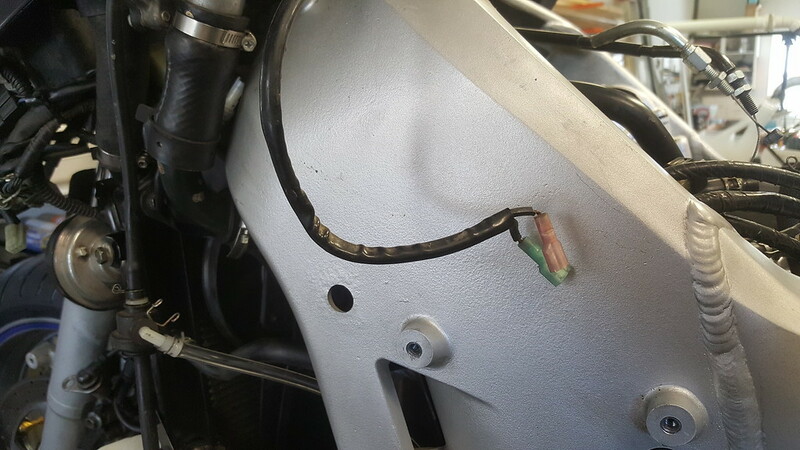 Two little green wires snipped off, and a little box glued on to the rear fender piece. Looked again, dug into what the two branches of white tape were covering up... something snipped off. 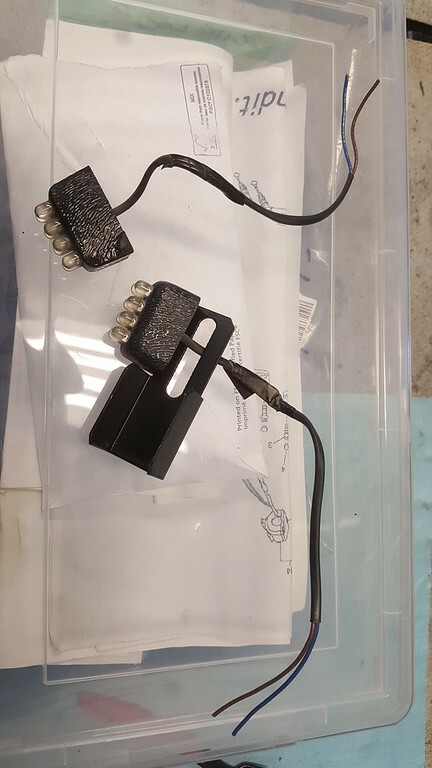 Brake light controller? Ah yes, memory coming back, I was later given the Hyperlites, found them in my own stash. Most likely will be removed and trashed. Dunno yet what those little green wires are for. 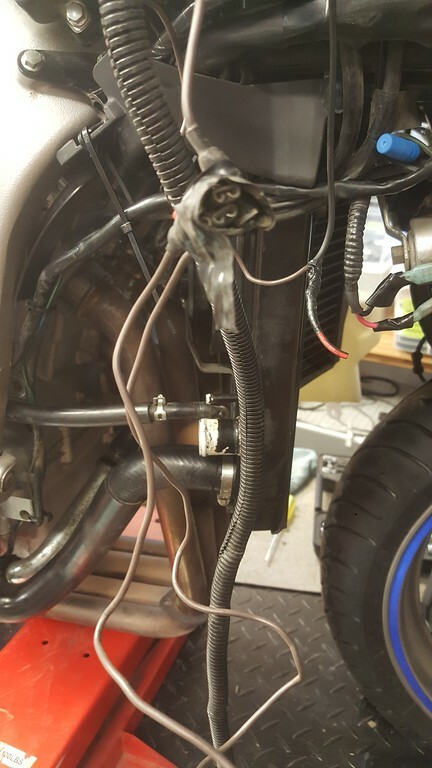 The horn wiring will be tested, the fork light crap removed also. The good news, it's the only add-on stuff I can find. Well, if you were observant, you may have noticed from the pics above that I got the radiator in. Sure could have used a helper, that thing was a bear. I couldn't install the headers because I'm missing a gasket (ordered, pick up Wednesday). But if you leave the lower rad mount undone, you can pull the bottom of the rad forward so you have plenty of room to get at header nuts. One piece I had to wrassle with is the big plastic air deflector that goes on behind the rad, up against the main wire harnesses at the front of the engine. So I engaged two helpers... one, a tie strap around the handlebars to keep that stiff old harness up so I didn't have to push against it much with the plastic piece. Also found out this bike had the spider recall, which is why I couldn't find that particular spider. 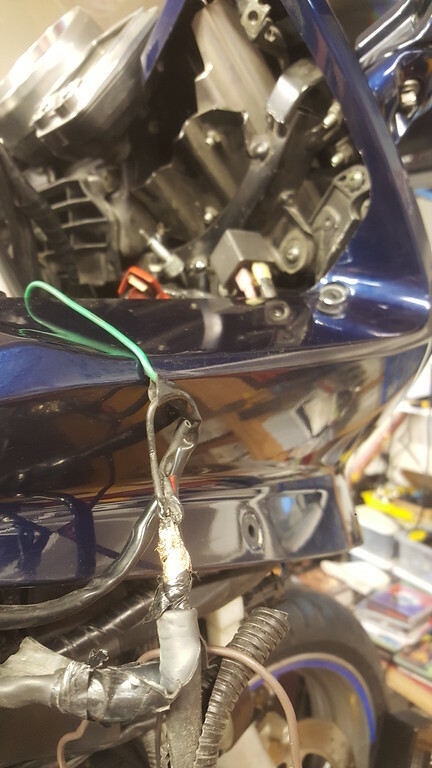 They plug a very robust harness into the spider, run it to the right side of the bike with an eyelet to attach to the negative batter terminal, and if that wasn't enough, they ran a thinner wire taped to the main ground wire going to the engine block (overkill). I unplugged it and greased it up with contact paste anyway. Got the stiff mass of harnesses up, such that I could "clip" the two ends of the deflector over the two mounting bosses, to which the rad's two upper mounts will bolt to. Tight here, the rad mounts need to be shoehorned into two slots for the brackets, push up and get the holes lined up. Easy to say, but try lifting the rad with one hand while you pry a bit here and there, and the opposite end of the rad wants to fall down. My second helper became doing up the upper rad hose on the left side so it could hold the rad up. A lot of wrassling still, spent way too much time on it. Eventually got it. No pics, wasn't in the mood, just happy it's in. Did up the fan conections, horns, etc. while I dug into where this add-on horn relay wiring all goes. Bottom end OK, gotta work on cleaning things up at the battery end. Later. Got other stuff going on. Back to removing the back wheel again to install the spacer I found, and of course, to install the u-joint. Removed wheel and final drive. 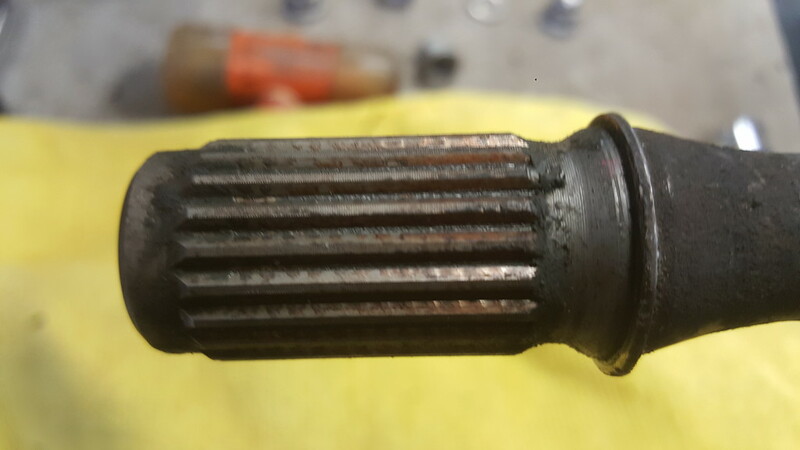 Check out the driveshaft splines, very little grease, it may have got some from the (suspected) swingarm bearing service someone may have done (remember the loctite on the right swingarm (locking) nut?). 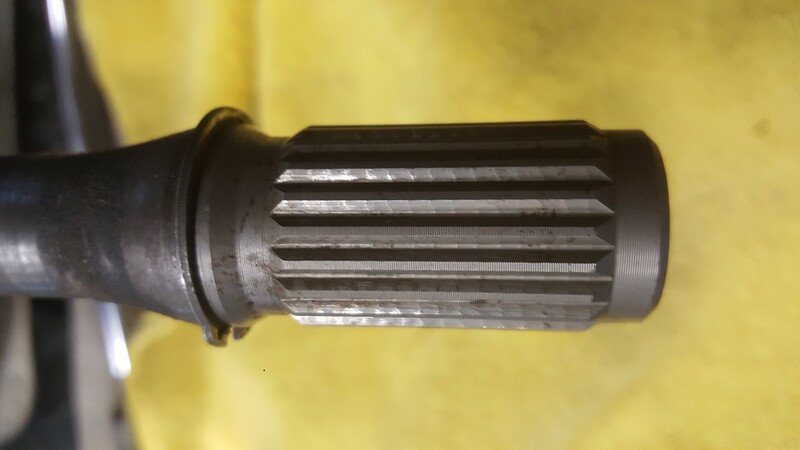 Initially I thought all the shiny spots were spline wear... cleaned it off and you can see the chatter marks from the original broaching/machining. Virtually no wear. 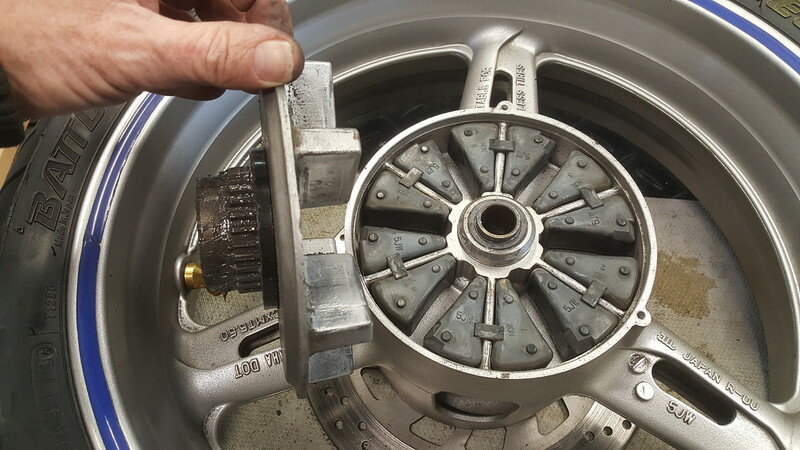 Remember too that the final drive is spring loaded such that the driveshaft is always pushed forward fully engaged with the u-joint at all times regardless of swingarm travel, so no longtitudinal motion really takes place. U-joint can float a bit, but not worth talking about. Two pics, dirty and clean. 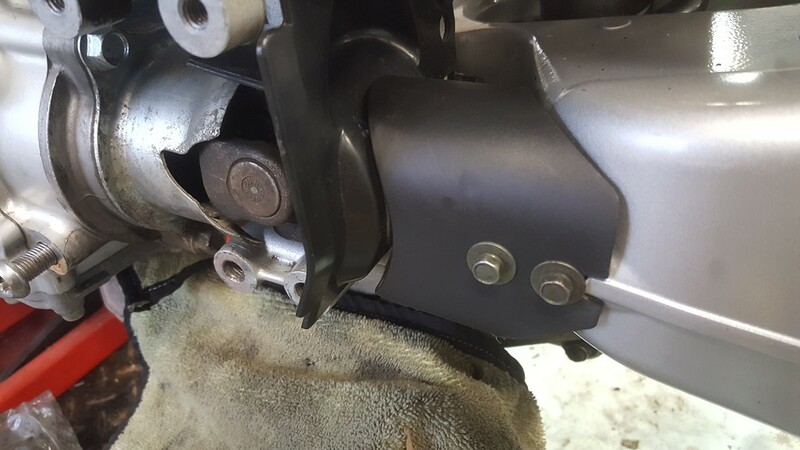 So here are the parts I have to install, u-joint goes through the plastic shield which is held on by a push pin (I have a stash from my automotive days), then the swingarm dust cover. All splines were given their light coating of moly paste, should never have to go here again for a very long time. Back to the rear wheel spacer..... had a fine time removing the 3 screws that hold the cush drive cover on. Damaged the heads with my impact driver and JIS screwdriver, as they were very resistant. Hmm, red loctite... now it kicked in, I wasn't the one who was in there. Found the cush drive rubbers are virtually brand new, I know for sure it wasn't me now, and thinking back to when I thought I was, I remembered it was me working on my spare wheel for the other bike, not this one. 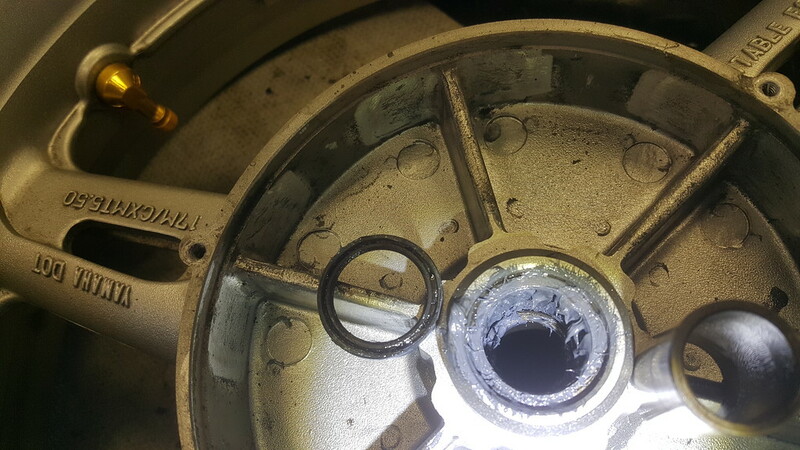 Spacer was in the wheel, now what. Needle bearing and bushing in good shape, not dry, gave the needle bearing a nice coat of moly, installed the bushing and seal, wiped off the excess. Checked my spare parts stash for the 3 new screws, and wouldn't you know, I bought these a coupla years ago. 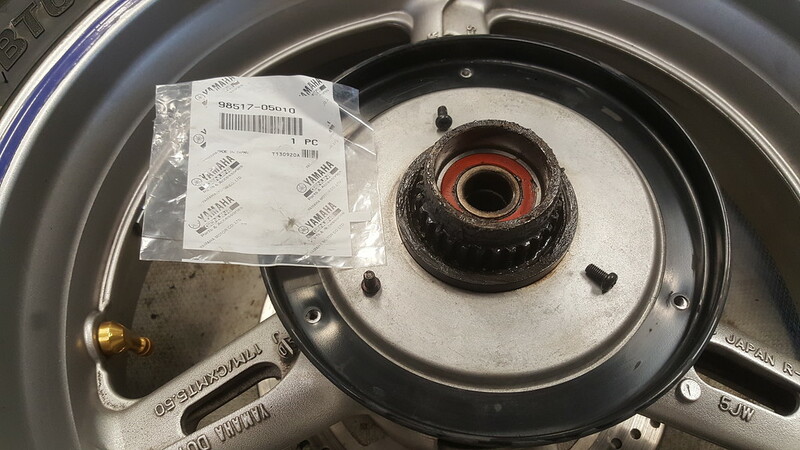 Rechecked parts diagram, then went to service manual, darn wouldn't you know the spacer gets inserted into the final drive, not the wheel. Duh! OK, got the back end all buttoned up, she's ready for the road back there. Well, time to bolt on some new shiny bits, but first, let's clean up the side stand, all greasy and dirty. 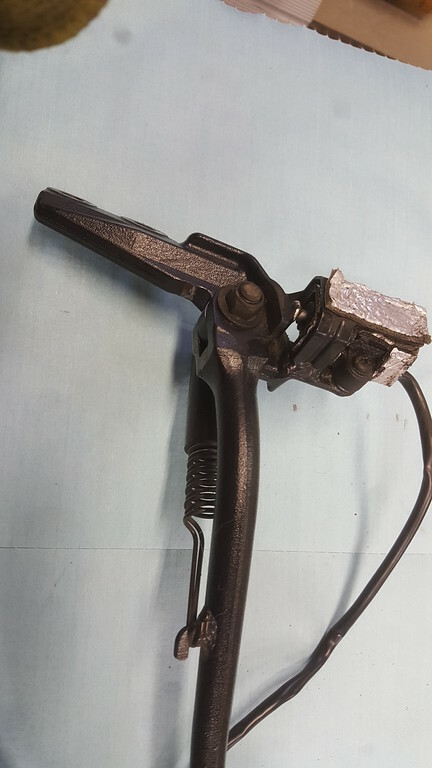 Notice the foam-backed foil piece on the back of the side stand switch..... heat shield. Very advisable to have it. Before and after cleanup. 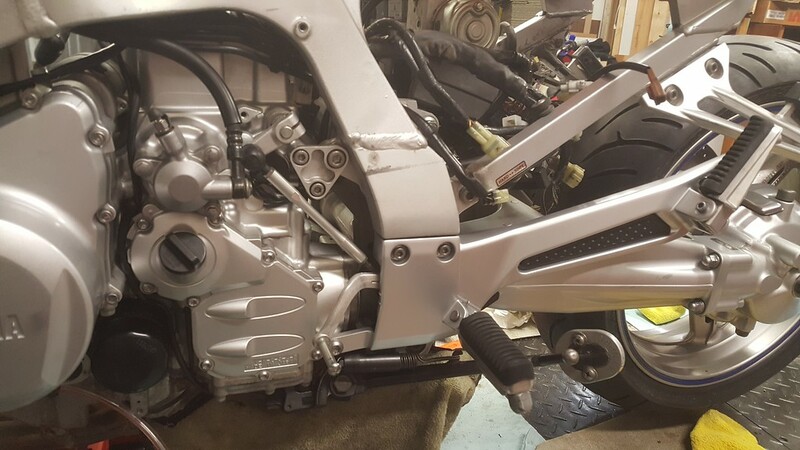 Lookie there, nice new shiny footpeg stay all nicely torqued up and the shifter cam installed. Starting to look like a real motorcycle! 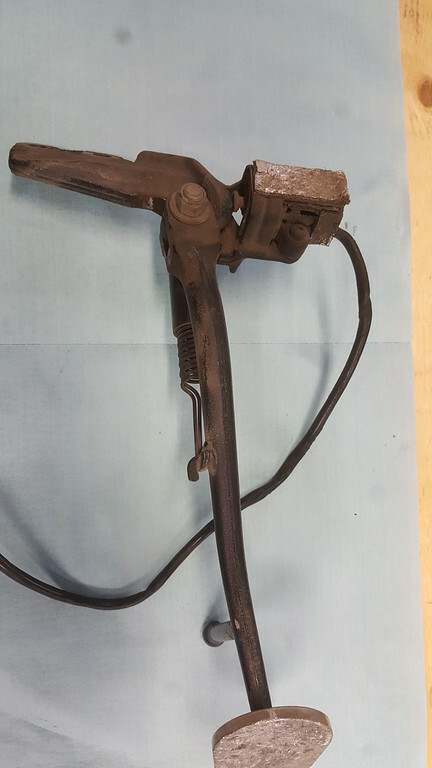 Old shifter rubber was worn down, way down... new one coming. So, how did you end up getting those 3 screws out, that hold the dust cover on?...asking for a friend. Kept on using the impact driver and the JIS #2 bit. Could not put enough pressure on by hand to do it without the impact driver. I pretty much ruined one screw recess, badly damaged another and the third just bad enough not to re-use it. I don't think heating would have helped much, might have, but that casting is a pretty big heat sink. I did not know it was red loctite until the screws were out. Yesterday, I became VERY familiar with that plastic piece that goes in front of the wiring harness and in back of the radiator. On the bottom lip of that piece (at least on the '14A), there is a rubber piece that resembles a windshield wiper. I found that piece partially removed and sitting on my exhaust yesterday when I was checking everything for leaks after a valve check and engine start up. I had to take off both lower fairings, and had a heck of a time re-installing it while making a very poor attempt at contortionism. I sprayed some spray adhesive in the groove before sticking it back on the plastic shield. Not sure that glue is going to hold up in the heat, but we'll see. Just wanted to point that out in case you wanted to take a closer look at yours NOW before everything gets in the way. 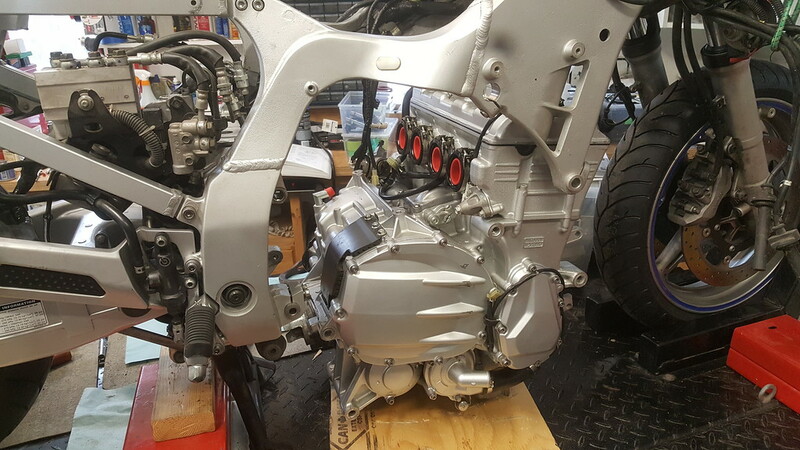 How do you plan to address the wiring harness differences between the gen 2 chassis and gen 3 motor? The ECU differences? I would never attempt anything that even resembles what you are doing, but like Fester's thread, I'm thoroughly enjoying reading and watching your progress, Ray. The parts diagram for the '06 shows 4 pieces of rubber, I presume to isolate the plastic from vibrating against the frame or such, maybe the 3 lower ones isolate the rad from the plastic.... upper piece ain't happening, I'm not taking that out again and no way it will vibrate against anything. I'll assess the lowers when I get the headers on so I can install the rad, see if we need to isolate plastic from rad contact. As I posted earlier, transferred '06 electrics to the '14 engine. Big one was the ignition pickup and trigger wheel, Fly By Wire is not compatable. Valve cover & sensor had to remain '06 and a couple others just because the connector changed, so I need to mate to '06 harness. Really, the whole thing is just one big jigsaw puzzle that isn't all that hard to figure out......... time, more time, work all day, eat, sleep, get up, do it all again. What's the big deal for today....... need a battery. Shopping around, everything's close enough pricing to just go with a Yuasa.... here, they're going for near enough one large and a half. Found one in Florida for U$87..... that converts to too much plus I'd have to go get it in Niagara USA. But wait, Amazon.ca (I rarely shop at Amazon, too expensive) has a YT14B-BS for C$94. IN! Ordered. IT will arrive on the front porch, don't get better than that. 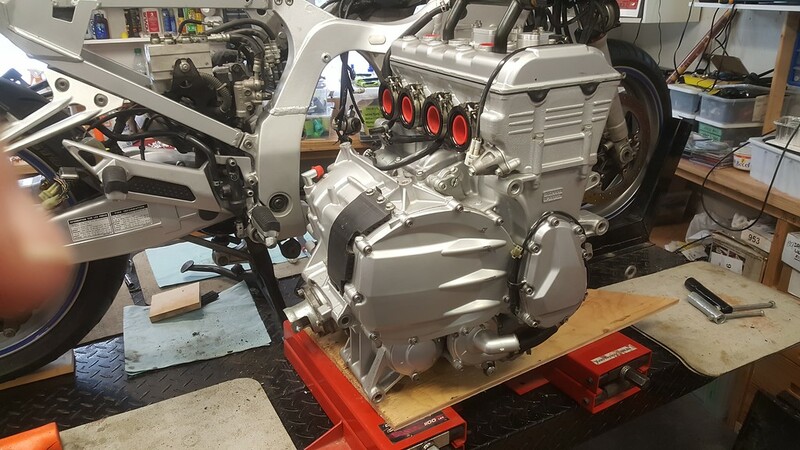 Local dealer will have my exhaust gasket tomorrow so we can get the headers on, and finish up the cooling system hookups.. I like way you work, Ray. Me too Organized.